Posted 23 months ago , 2 users are following. I would like to ask if anyone had any experience with an 'accute blue finger syndrome'? The effect is very much like that of Raynauds (spasm of the small blood vessels causing restriction of blood flow / numbness / burning pain), but this only affects one single finger, the finger turns blue instead of white, and the event is not neccessarily triggered by cold. The finger is hyper-sensitive. The first episode in the little finger on my left hand lasted about 6-8 weeks and caused me a lot of pain. If I accidentally bumped my finger pain shot like a lightning bolt up my entire arm. Several times I woke up during the night from the intolerable pain, which didn't show any reaction to painkillers. Next to the nail I developed necrotic tissue which later fell off (Jeeeez!). Even when the wound and finger finally healed it was still sensitive and I could still feel the trauma the finger had been through for a while. I am experiencing episode #2 on my ring finger (right hand) which appeared middle of March. 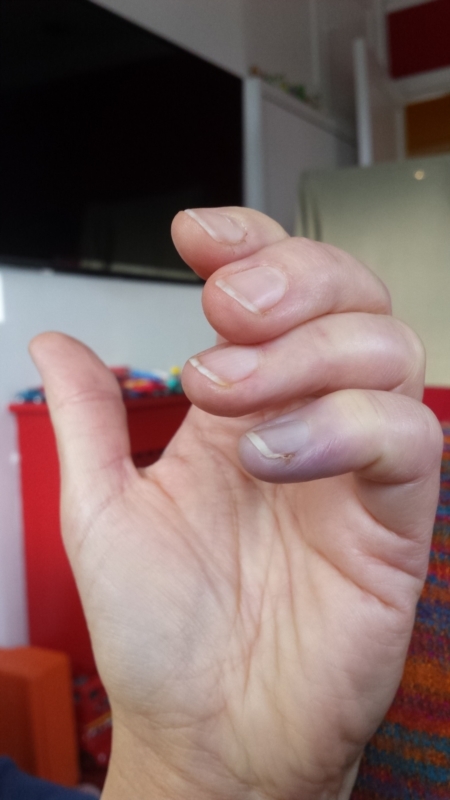 After showing Raynaud's-like symptoms (white fingertip, numbness) and also increased sensitivity (not a Raynauds symptom) I suddenly was in so much pain one evening that I didn't know what to do with myself and I eventually took myself to A&E! (pointless, as the hospital didn't even have vascular services and as the pain fairly suddenly disappeared as if someone had flicked a switch). The finger is swollen and stiff - I can't bend the last digit at all and I can't straighten the finger which makes everyday tasks heaps of fun. Meanwhile I started to notice the potentially first symptoms (increased Raynauds white fingertips, burning sensitivity in the finger) in the middle finger of my left (!) hand! Seriously? My right hand is already in a fairly disabled state, now the left hand too?!? I have had a series of tests done at the vascular surgery department at UCLH London, including a Doppler ultrasound test of the arteries in my arms and neck, as well as a CT scan. Doctors couldn't find anything wrong and I was discharged from any further testing. I am now awaiting for a referral to a rheumatologist for further tests. But essentially they are telling me that the tests being done are for the purpose of excluding certain things but that we are not under the illusion to find the actual cause and treat / heal it. There is some information available on the internet, although it is pretty clear that the 'acute blue finger' (as was diagnosed by Prof. Toby Richards at UCLH, who also wrote a scienticic paper about the syptom) is a rather rare occurence, as opposed to Raynaud's which is fairly common. 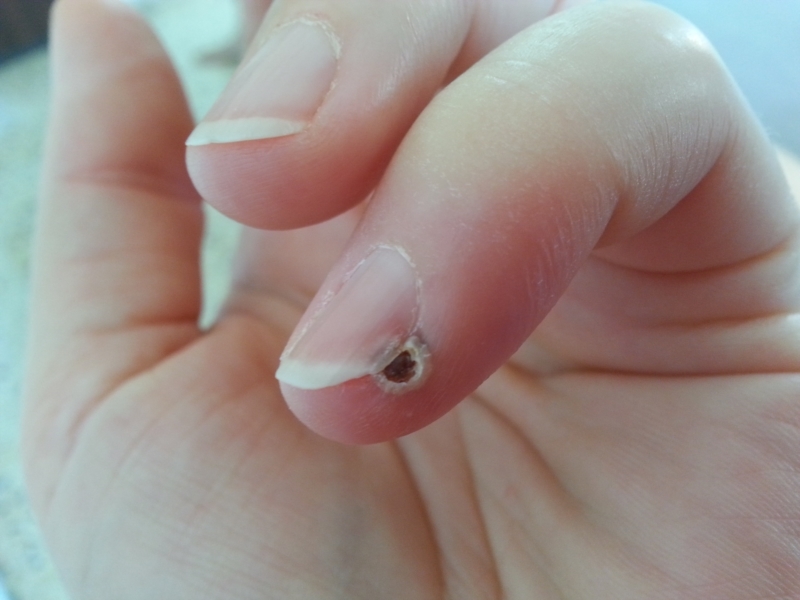 Most articles decribe the disease as a benign condition (for me or for my finger??) which heals by itself (it doesn't state how many weeks it takes and rules out the possibility of necrotic tissue loss). I have also been diagnosed by a dermatologist with a patch of morphea (scleroderma?) on my back, which is an overproduction of collagen which causes thickening of the skin. I have reason to believe that there might be a connection between the two. My best hope is now to look for anyone having had any experience with this and discussion forums like this. Any help welcome! As I sit her wide awake from the pain in my right index finger, I feel you just wrote my story! My left index finger started first, now my right is the worst and some parts of the middle fingers, too. The pain is exactly like you wrote (which really helps me because it always made me feel crazy to try and explain it), and it’s blue with dark necrotic tissue under the nail. After seeing a hematologist and a vascular specialist and undergoing many tests, a rheumatologist diagnosed active dermatomyositis and advanced Raynauds. She said it’s not uncommon in her world of patients to see individual digits or even just parts of a hand or foot with Raynauds, and she’s treated blue, purple and black fingers. She started me on a month-long regiment of prednisone, amlodipine as a dilator for my fingers, and plaquenol for the DM. This is only my second day and I haven’t seen any difference in the 24/7 pain. Sleeping is the worst because sitting and laying seem to make the pain worse. My left hand is not as bad now that the tissue has died at the tip and is coming off, but the right is excruciating and the “attacks” can debilitate me for an hour. I work on a computer all day so I wear thick but soft Gloves all day. I was living on big doses of ibuprofen to dull the pain, but I can’t take it now while on prednisone. The Tylenol just doesn’t cut it. I can let You know How it goes From here. I just want relief...and sleep! I am sorry to hear you are in so much discomfort! I hope with the help of the specialists you will soon find a solution which helps you. A lot has happened since I posted this and I will give you a quick run-down of events in the hope this will help you: After being discharged by the vascular specialists (they couldn't find anything wrong) I was then referred to rheumatology at the Royal Free and in Summer 2017 I finally received my diagnosis: Severe (secondary) Raynauds with Limited systemic sclerosis (the term "accute blue finger" came from Prof. Richards at the UCLH, which was absolutely wrong). I am now under the care of the CTD department at the Royal Free and feel in very good hands as they are very specialised and experienced in the field. While Nifepidine didn't do very much for me, I am now on a cocktail of Sildenafil, Fluoxetine and Losartan and feel thiis has helped me (it has been a long while since I had such strong pains!). From what I understand now... white fingers means: lack of blood, blue fingers mean: lack of oxygen. If the later continues for a long enough time the connective tissue and also nerves will get damaged. The nervepains develop due to some tissue dying off / becoming necrotic. Once the tissue is dead it will fall off and the strong pain will stop and be replaced by itching and tickling (the repair process). The tissue underneath tends to be very pink and sensitive and the nerve will take a long while to calm down. The healing process takes a looong time due to the continued lack of blood flow. I am also showing most symptoms of CREST, so the underlying cause for me is Scleroderma. I believe the rheumatologist is the right place for you to be looked after. With the help of blood tests (the ANA value is the important one). I don't know where you live, but try for a referral to the Royal Free is you can. There are various meds out there that can help you, it is just about finding the right mix for you to get the severe Raynauds under control. I am currently on my first Iloprost infusion and will see how that goes. This stays in the body for several weeks or even months and many people get infusions annually to get them through the winter. 5 days seems like an inconveniance, but if it helps that it will be worth it. Good luck and I hope they will get you to a better level very soon! All the best!